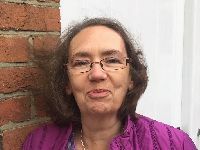 Yvonne is an all round creative person, with a gentle quiet personality, who enjoys running small groups to help them develop their creativity. She is a writer of a sketch book production, a choreographer to a Christian dance group who performed at Spring Harvest, a musician who leads worship at a Saturday church as well as an artist who has exhibited at Harvey Road Gallery in Guildford. She writes: "What I have really enjoyed over recent years is drawing and making biscuits that speak of the heart of God at venues ranging from from pop festivals to church fetes with a group called ‘Eden People’. Some would find this a challenge but to me this is a joy."